This is another in the Matthias Media series of Six Steps … studies. There’s some video input (two short videos each session), as well as discussion questions. It’s well-suited to use in a group, but I reckon these questions could also work for a solo reader. The studies are for any and every Christian. And they aim to help us move from being consumers and users of church to being loving servants of church. It aims to be a series that changes behaviour at church, as well as thinking. Fitting in with the ‘behaviour and thinking change’ aim, these six steps do not include in-depth and lengthy study of Bible passages. A couple of the studies don’t look at the Bible at all. It felt a bit odd not to open the Bible – but perhaps that’s evidence of how I’ve been small-group-inculturated. In any case, the six weeks are all underpinned by clearly-explained biblical ideas about church. Also fitting the aim of real change, each week has assignments. For example, don’t sit in your ‘normal’ seat at church. Or, think of people to invite to church, then share those plans with the group. In my group, people loved the assignments. They made a strong link between the ideas we discussed and our regular behaviour. By making the link, we were better able to remember the ideas, too. Because the ideas link from study to study, and because assignments are set and then followed-up, it really is best for people to get to each study. It’s possible to benefit even after missing part of the series – but much more possible if you can make it to each of the six steps. The discussion guide has leaders’ notes. They proved mostly superfluous to us, but would perhaps give confidence to a very new discussion leader. I highly recommend this short course. It can fit in well as part of an existing small group (as long as you usually spend more time in the Bible and at prayer). 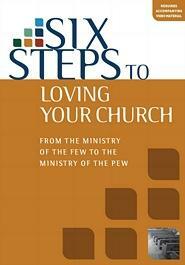 It can also be used as a stand-alone series, perhaps in a church ministry training programme. This entry was posted in Christian living, Ministry and tagged Church on 22 April, 2014 by Chris. Here’s a beautiful description of church from Home, a novel by Marilynne Robinson. I love the ways this combines the local and personal (that building and that preacher) with the unchanging doctrines of Christ. For her, church was an airy white room with tall windows looking out on God’s good world, with God’s good sunlight pouring in through those windows and falling across the pulpit where her father stood, straight and strong, parsing the broken heart of humanity and praising the loving heart of Christ. That was church. This entry was posted in Books, Christianity & culture and tagged Church on 6 December, 2013 by Chris. Listening to our church sermon on Acts 12 (our talk recordings are here) it was impossible to miss the parallels between the attack on Jesus and the attack on the church. Within five short verses, Luke artfully associates Jesus’ Easter experience with the life of the Jerusalem church. Here are the details that establish the link. When Jesus was arrested, Pilate drew a Herod – Herod Antipas – into the trial (Luke 23:7-8). In Acts 12, it’s another Herod – Herod Agrippa – who arrests Jesus’ apostles (Acts 12:1). The Herodian family can’t keep away from mischief! Jesus was crucified, yet was delivered from the tomb. In Acts 12 James is killed while Peter is delivered from death. The experience of the church was not simply one or the other – there’s both death and deliverance. These similarities build up a picture. Luke, I believe, wants us to see that the attack on the church in Jerusalem was like the attack on Jesus in Jerusalem. It’s not an exact parallel in each detail, yet there is a definite likeness. Jesus uniquely lived out Easter. Jesus’ death and life is the hub of God’s work. The church is built on Jesus’ Easter ministry. And also the church embodies Easter. The shape of church life is Easter. Why point this out? So we have right expectations. Church life, in other words, is the same turbulent and confusing and troubling life that Jesus experienced as part of the first Easter. And church life is certainly the place where God himself is at work for good. This entry was posted in Bible, Christian living and tagged Acts 12:1-5, Church on 31 July, 2013 by Chris. In a specialty shop I expect to find people with working knowledge of their products. In a family-oriented park I expect seats, public toilets, and no one driving cars. In an aeroplane I expect seatbelts and a safety demonstration. In each place, expectations shape the whole experience – and guide my behaviour too. So what are the right expectations to bring to church? Our understanding of church will direct the way we decide to live. I won’t unfairly influence your thoughts by listing what we said! But I am interested in what you think. What insights jump out for you? This entry was posted in Christian living, Ministry and tagged Church on 24 June, 2013 by Chris. 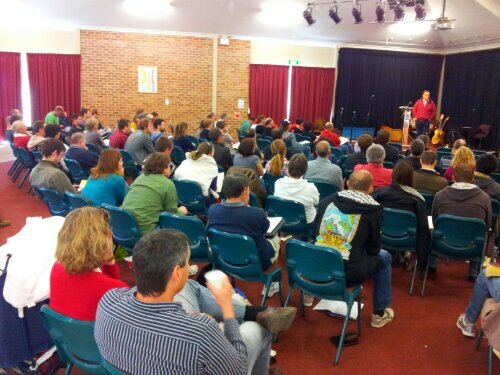 At Albury Bible Church, we recently put together a tool to help us plan what we do. We think there are three main things: Welcome. Grow. Serve. Welcome: in the gospel of Jesus, God welcomes us to his family. Therefore we will tell people of that welcome, as well as welcoming them into our church family. Grow: it’s normal for God’s children to grow in the obedience of faith. Therefore we will make Christian growth normal for our church members. Serve: Christians do not grow for their own sake, but in love. Therefore we encourage and train for service, both in church and in the wider community. ‘OK’, I thought, ‘when we launch this, I’ll talk about how it works for Sunday’s 10am church meeting.’ So I spent time pondering how our Sunday morning expressed these plans. What we do – and we’re not very unusual – is a mixture. And that mixture is both a help and a hindrance. Sunday church is a mixture. We welcome, because people walk in off the street. We announce that Jesus is Lord and invite people to follow him. We grow because we always read and hear God’s word for instruction, encouragement and challenge. We serve because … well, have you seen how many people it takes to run even a simple church service! Sunday at 10am is everything – welcome, grow, and serve. That has to be a good thing. It also is an encouragement to be very clear in church each week. Church is not humdrum – it is a bright spotlight on ourselves and what we think really counts. The three-in-one nature of Sunday @10 is helpful in another way: for a church health test. We should ask ourselves how we are going at welcoming, growing, serving. Easy to ask – not always easy to answer. Perhaps the place to start is at church. Is there evangelism on the agenda on Sunday mornings? Are new or shy people welcomed further into relationships? Do Christians grow there, or do they stagnate? Are more people serving? Are long-term servants receiving support to stop burn-out? The answers might be confronting. But good to know. The three-in-one nature of Sunday morning is also a hindrance, a risk to our church ministry. Simply because it can’t do any of these three things at great depth. Church is good, but it’s not enough. If we were to rely on Sunday mornings to do our evangelism, we would be doing very little evangelism. If Sundays were the only point of welcome, our relationships would be paper-thin. If Sunday morning was the only time of help for Christian growth, we would all be stunted in faith. If this were the single focus for service, the opportunities would be limited and the people soon exhausted. I reckon that to think ‘Sundays are going OK’ is a risk to ministry. The risk is a false equation – that ‘Sunday is OK’ equals ‘We are going OK’. They are not equivalent! How this factor works out will vary from church to church. For our church, we see the need to complement Sunday morning with a whole range of further ministry. We specifically evangelise in a dedicated programme called Connect, reading Mark’s gospel together. We need to make more of our church membership. We emphasise our Open Bible Groups as the primary growth-focussed ministry. And Night Train is just one way we support and develop serving. As the fanatical texters say, YMMV* but, to thrive as faithful communities, all our churches will need to do a good job away from the main Sunday meeting. It feels like I have re-discovered what is obvious. But that’s the type of discovery I like to major in! What are your thoughts? I’d love to hear more and to engage in discussion about this. Comment away! This entry was posted in Christian living, Ministry and tagged Church on 8 May, 2013 by Chris. 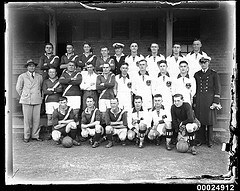 For readers who are part of a church, have you ever thought that your church is just like a soccer team? Because I have. In a soccer team, everybody gets to put foot to ball. We all work so our team can score. In other words, the small skills are the same (kick!) and the big aim is the same (score more goals!). Sure, there are differences. Left-footers, right-footers, and ambidextrous freaks. Some run faster, some defend better. But whatever position you are on the team, you kick the ball. This reminds me of church because everyone who trusts Jesus has the same tasks: live in godliness and speak about Jesus. One might struggle with greed and another with anger – but both seek the Father’s help to struggle well. And, I’m convinced, God wants us all to speak. Here are some of the types of speech: prayer in Jesus name (private or in groups); singing that encourages faith and gives thanks to God; answering questions about ‘God-stuff’; teaching Sunday school; preaching; leading a Bible study group; sharing a Bible passag to encourage a friend; door-knocking the neighbourhood; teaching your own family the Bible; etc. Some speech is more flamboyant – like the flashy football striker. Some is really high pressure – like taking a penalty. Some is essential but almost unseen – like the hard-working defender. Yet it’s all speech for Jesus. Now, every soccer team has one odd-bod. The goalkeeper. The keeper also gets to kick the ball. And the keeper has the same aim – that the team score and win. But they also get to handle the ball, and wear funny clothes. They’re a bit different. Just like paid ministers (that’s me). There are many similarities between goalies and ministers/pastors. Have you seen the funny clothes we ministers sometimes wear? This entry was posted in Christian living, Ministry and tagged Church, Colossians 3:15-17 on 1 March, 2013 by Chris. It’s not news to tell you that, as a minister, I think about church. Some thought is theological (what does God say about church?). Some is social or cultural (what does church look like in Australia?, what do my neighbours think when they hear ‘church’?). And some is pragmatic (what should we do this Sunday?, how can we better help our leaders do what they do?). These categories overlap, of course, but it helps to know about the different angles or perspectives we can take. This is a pragmatic post about church: I suggest a way to think about what church does. My suggestion: we should think that a church service is like a flag. Specifically, a military flag, a battle standard. As an admitted military innocent, allow me to consider the use of a flag on the battle field. A flag doesn’t really do anything. It’s not a weapon (except in desperation?). It issues no orders. It does not analyse the ebb and flow of battle. It provides no materiel. It fails to function as a medic. But it does reduce your fighting force – a bloke has to carry it about. For all that, the military standard appears important. It does not flight, but those who do fight co-ordinate themselves around it. The flag stands central to the battlefield, defining what the war is. Its appearance is a message of motivation: this is who we are, and this is also why we fight. If the flag-bearer falls, it’s imperative that someone else take his place. Without the flag, soldiers risk being scattered about the field. They can end up expending heaps of energy but to no good purpose. And remember, war is dangerous. It’s cruel to ask people to risk hurt without purpose. Church doesn’t really do anything, either. Except exist as church. It sometimes looks like nothing more than a bunch of people gathering repeatedly out of habit. There’s a sameness about church – just as there should be (after all, the theology of church hasn’t changed since the first century AD). Church does not have a profit motive, like a company board of directors. Church does not aim to win a premiership, like a training squad. It does not even seem to be as useful as other Christian group activity: going door-knocking; visiting the sick; establishing an orphanage. But for all that, I am convinced that without church Christians would do nothing. Church is a central signal of who we are are whom we follow. Church is necessary, encouraging, motivating, challenging, painful, joyful. The people of God should love the church God has given us. Who is it that hates church? It is those who hate the military standard on the field of battle: the enemy. I must ask God for strength not to become a traitor to the flag of Christ’s people, the church of which Christ is the head. This entry was posted in Christian living, Ministry and tagged Church on 28 September, 2012 by Chris.